At Deltec Consulting, expediting EMV certifications and bringing terminals to market in a timely manner with competitive pricing is our core business and we would love to help you succeed! 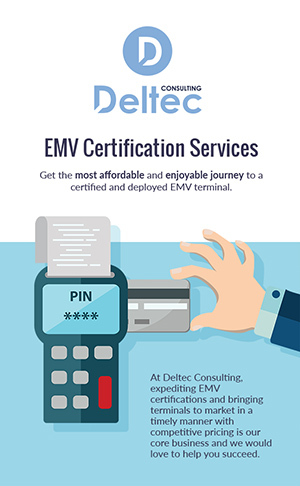 With its proven EMV experience and Card Brands’ accreditations, Deltec Consulting has developed Certification Services to support the stakeholders with their EMV Level 3 debugging, precertification and formal certification phases. We provide real-time support for the development team to help expedite the EMV payment application coding efforts by delivering prompt real-time answers to technical EMV questions. We complete the different testing phases of the EMV certification process, from beginning to end, onsite or remote. "Professional, efficient, friendly and extremely easy to work with!" "They always acted professional and took ownership of issues and needs to the point they seemed to be an extension of the team vs an outside entity." "As Service Provider for Diners Club payments, DC Bank AG has already performed E2E EMV certification tests for many European acquiring partners. Deltec Consulting has been always proven as a reliable, fast and cooperative Service Provider for checking and approving test results. They consistently met our high quality standards during time-critical projects."